After performing the Anytime Camera Mod, I noticed reverse camera's wide angle view is useful while traveling at speed on the highway as a pseudo blind spot monitor. In the aforementioned mod, I already had installed a switch to activate the reverse / backup camera anytime I wanted, now all I had to do was add the ability for the camera to automatically come on when the turn signals are activated. 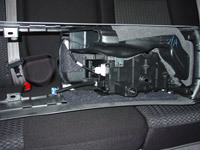 The factory Toyota navigation setup has a backup camera system that when the vehicle is put into reverse, it automatically sends a video signal from the backup camera housed within the rear tailgate, up to the nav screen. 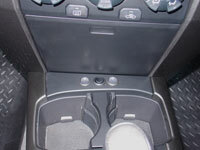 A switch will be added to fool the navigation system into thinking the vehicle is in reverse even though we are not. 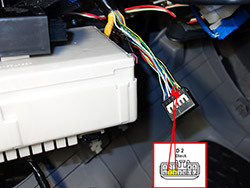 This "anytime backup camera" switch will activate the camera and automatically force the nav screen to change from whatever is currently being displayed on it (such as maps, audio, etc. ), to a direct video feed from the camera. 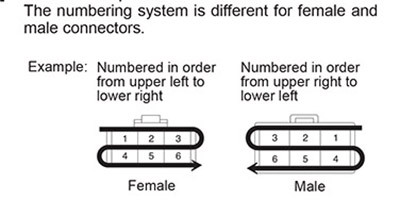 We need to build an electronic switching circuit that will fool the navigation system to thinking it is in reverse in two scenarios 1) anytime via a switch or 2) when a turn signal is activated. 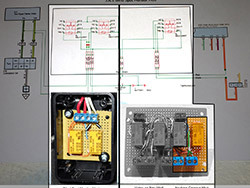 In this circuit, one relay will be used to isolate the reverse signal so that it does not back feed into the ecu and fool the nav into thinking it is in reverse. 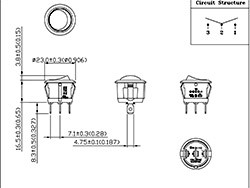 The other two convert each of the negative turn signal feeds to a positive one and route that to the first relay mentioned above. 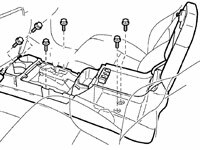 Here is the Toyota 4Runner blind spot monitor mod, in schematic form that I created which also shows how it is wired into the factory navigation system. Since I performed the Anytime Camera Mod and Nav Video Mod previously, the construction of my blind spot monitor mod (pictured below) is esentially an add on to those mods. 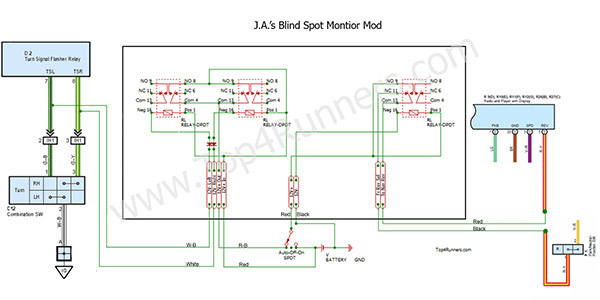 The schematic posted above though is all encompassing, meaning that if you did not already perform the Anytime Camera mod or the Nav Video mod, no worries, everything is on this schematic to get full functionallity of the Blind Spot Monitor Mod. 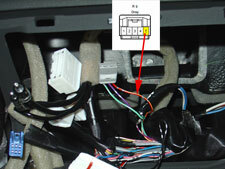 Begin by removing navigation unit to access the wiring behind it. 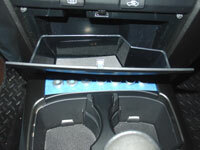 To remove the center instrument cluster, start out by opening the storage bin under the climate control assembly. Using a 10mm socket, remove the one bolt that is in there. 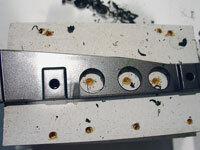 Disengage the 4 clips and remove the air conditioner assembly, and then disconnect the wiring connector on the back. 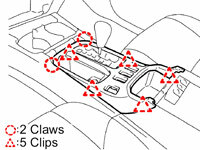 Now you can remove the center instrument cluster finish panel sub-assembly. First remove 3 bolts using a 10mm socket. 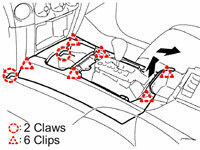 Then disengage the 8 clips. 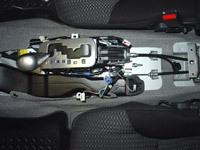 At this point you can disconnect the three wire connectors from the hazard lights, rear window control and 4WD selector. Set the panel aside. 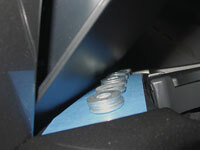 Using the 10mm socket, this time with and extension bar, remove 4 bolts holding in the navigation unit. Pull the navigation unit straight out. 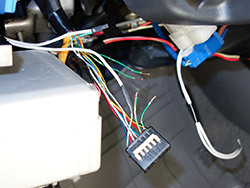 In order to work on the wiring, you will need to disconnect the 9 wire harnesses on the back side. 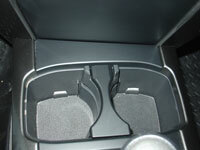 Then set the navigation unit aside. 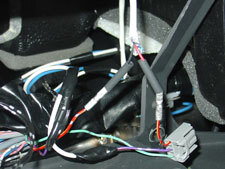 With the navigation unit out of the dashboard, it is time to splice our module into the factory wiring. 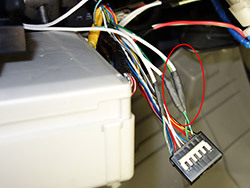 Identify and cut in half the backup camera trigger wire which is the red wire with yellow stripe located at pin5 in the R9 connector. 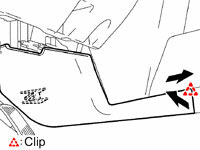 Run a wire from the connector side of the cut wire to the common prong of the first of three relays (pin 30 or 13). 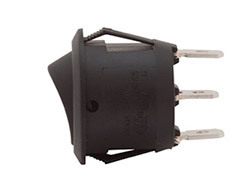 Run the other side of the wire to the normally closed prong of the relay (pin 87a or 11). 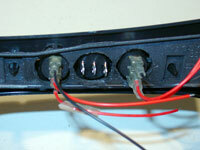 Run a ground wire to one side of the relay coil (pin 86 or 16). 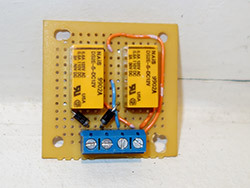 Run switched 12V+ to the other side of the relay coil (pin 85 or 1). Also run switched 12V+ to the normally open prong of the relay (pin 87 or 9). Tap into the turn signals. 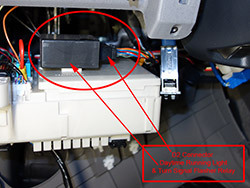 Locate D2 Connector on Daytime Running Light & Turn Signal Flasher Relay which is mounted on the back of the driver side interior relay/junction box. 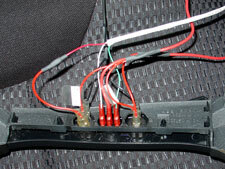 Identify Pin #7 (left turn signal) green with black stripe wire and #8 (right turn signal) green with yellow stripe wire. 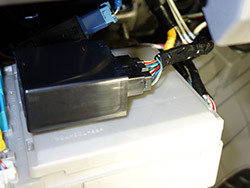 These are the wires that turn signal stalk use to a send a ground signal to the Daytime Running Light & Turn Signal Flasher Relay. Cut these wires in half, one inch from the connector. 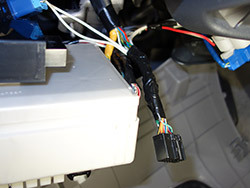 Connect a length of 18awg (American wire gauge) wire to each of the cut sides and run this wire from here to where you will mount the blind spot monitor module. A 12V SPDT switch is needed for this mod. 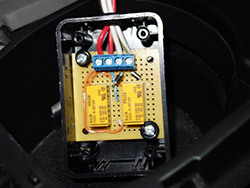 I used a round rocker switch that matches the one I used for my Navigation Override and Unlock Bypass Mod. 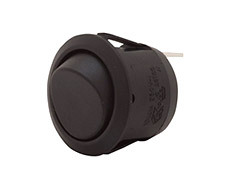 12V SPDT Round Rocker Switch. Del City. 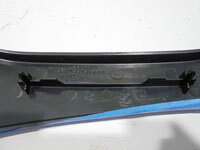 Terminals: 3 standard male brass blades, 0.187" wide x 0.327" long (4.75mm x 8.3mm). 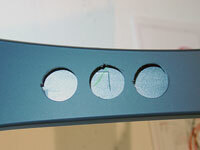 Panel Thickness: fits panels 3mm max thickness. 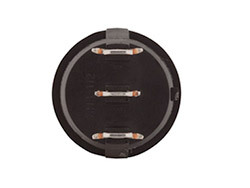 Mounting Hole Dim. 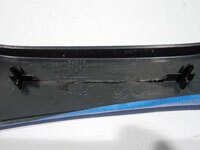 Inch 0.775" (19.8mm). 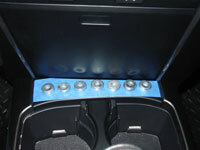 I decided to locate the switch that activate this mod on the blank panel right behind the cupholders. I found a nice 12V round rocker switch that only required a simple 3/4" hole to be drilled for installation. 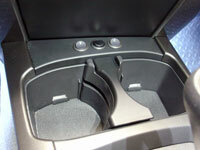 This switch fits perfect and is low profile enough that it allows the bin under the radio to open fully without interfering with the switch. 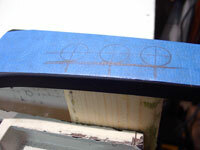 I used 3/4" washers to layout the spacing and check for clearance before drilling. I am using this panel to house multiple switches for various mods. So the pics that follow so me installing multiple switches all at once. You will notice I'm installing three of these switches in total. 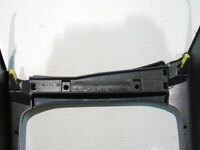 This panel will hold between five to seven switches depending upon the spacing used between them. 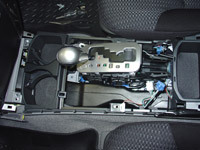 After completing the installation of the relay module, associated wiring and switch, reinstall the navigation system back into dash. While I relaize that there will be naysayers who insist that this is a useless mod if you set your mirrors correctly, from my perspective this is a very low cost, "fun" mod, done as an add-on to the already performed anytime camera mod to simply show just what can be done with some inventive ingenuity. 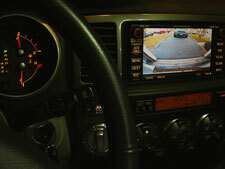 The Anytime Reverse Camera feature can be quite useful while towing and wanting to check on the hitch connection. The Blind Spot Monitor function is useful at high speeds when wanting that extra assurance that no one is in the area that your rear and side view mirror are not quite capturing. The mod can also be turned totally off for city driving when using the navigation's directional guidance feature and you dont want to have the screen change automatically to the reverse camera while navigating an unfamiliar area with many turns.